This is the standard type of SCL’s self-sensing cantilevers. 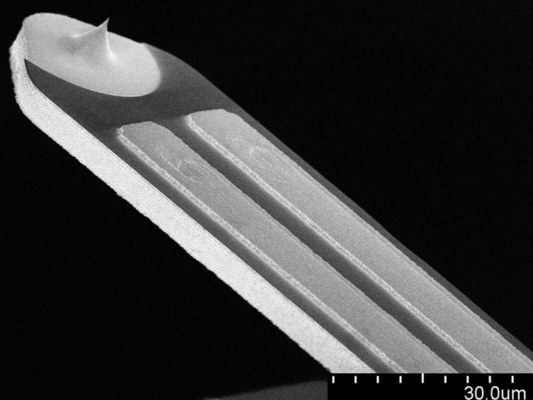 It exhibits a sharp tip made of silicon with a tip radius of <15 nm. By standard the cantilever is delivered on our cantilever printed circuit board (CL-PCB) with a small 10 pin connector on its lower side. For special applications you can order only the non-bonded silicon chip for bonding onto your own PCB holder, too. We offer this cantilever type with or without an integrated heater. Our PRSA (Piezo-Resistive Sensing & Active) cantilever probes are equipped with a thermal actuator (heater structure) and a Wheatstone bridge on the cantilever. PRS (Piezo-Resistive Sensing) cantilever probes provide the sensing Wheatstone bridge (without a thermal actuator). Piezo-resistive self-sensing 300x100 µm cantilever probe with a silicon tip bonded to a small PCB with a connector or non-bonded as silicon chip. 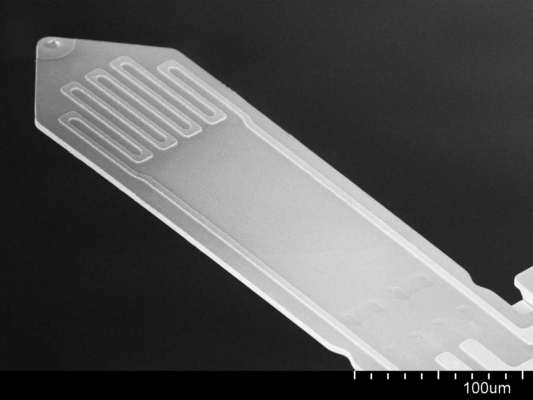 Piezo-resistive self-sensing 70x30 µm cantilever probe with a silicon tip bonded to a small PCB with a connector or non-bonded as silicon chip. 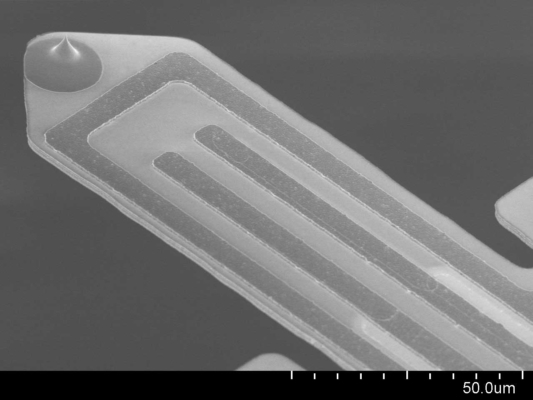 Piezo-resistive self-sensing 100x48 µm cantilever probe with a silicon tip bonded to a small PCB with a connector or non-bonded as silicon chip.